I'm going to be out in the DC area in a couple weeks. Reading this thread, I've decided that I will visit Pizza Paradiso, 2 amys, and Full Kee. Now, are there any other places that I shouldn't miss? I highly recommend checking out the $45 three-course prix-fixe menu in the lounge at CityZen. As I wrote in my July 24 post (further up this page), that meal was the highlight of my trip to DC this summer. Excellent! I am writing these suggestions down and will try to report back after that weekend. $45 will be a little steep for the people I'll be on vacation with. It's already an expensive weekend with the flight, hotel, car, gas so I doubt they'll want to spend too much on just one meal....even if it sounds worth the money. I was in DC for the Cherry Blossom festival this past April and enjoyed excellent fried oysters and pomme frites at Dupont Circle at a place called Firefly. As the eGullet foodie forums had promised, they had to die for fried oysters ("Crisp oysters with chipotle tarter sauce") and truffle parmesan frites. The bread presentation was adorable in keeping with their backyard theme (they had a fake tree in the middle with lanterns hanging from it, and the iced tea came in mason jars with handles. The check came curled in a normal mason jar). Those frites were amazing- I love my fries extra crisp, and usually will pick out those particularly crunchy ones from a pile first. No need with this batch- they were all perfectly extra crisp. I saved the chipotle tarter sauce for the frites too. I had this during lunch which was perfectly sane and peaceful: I had been warned that dinner is a mess because it gets so crazy busy. So if you happen to be at Dupont Circle and want a fried, completely unhealthy but sinfully delectable snack you might want to consider this. Not a destination place as far as eating (though their pizza is good), but The Brickskeller near Embassy Row and Dupont Circle is a great place for a beer, since they have about 2000 different kinds (no joke!). It's a neat place, with lots of exposed brick and an industrial feel to it. Can anyone tell me about Peking Gourmet Inn? I've read reviews that are mixed but the consensus seems to be their Peking Duck is excellent. I've been told the same by a few friends but they say it's a little pricey for what you get. My hotel is about 20-30 miles away from Peking Gourmet Inn. Is it worth going out of my way for? The hotel I'm staying at is in Restonbut will be spending most of my time around Capitol Hill. hiddenboston wrote: Not a destination place as far as eating (though their pizza is good), but The Brickskeller near Embassy Row and Dupont Circle is a great place for a beer, since they have about 2000 different kinds (no joke!). It's a neat place, with lots of exposed brick and an industrial feel to it. They do have a lot of beer, but when I lived in DC for a couple years, they advertised 500 different types. Have they quadrupled the amount or are you estimating? Don't get to DC all that often any more and haven't been there in a couple of years. There are many fine places to dine there from the ridiculous to the sublime, but the one thing I have to mention for those who might be inclined is that the aforementioned Old Ebbitt Grill serves the finest, most expertly prepared grilled calves' liver with onions and bacon that I've ever tasted. I used to time my arrival at DCA so that I could drop my bag at the hotel, hop back on the Metro and have a plate of the liver in front of me at The Old Ebbitt Grill's bar before the lunch rush hit. Don't know if it's still on the menu, or still as good as it used to be, but this thread made me hungry for it just thinking about DC. Well, the upshot is they have a lot of beers, who knows how many. Ah, I found the page. The joke about this place when I used to frequent it was that they had hundreds of beers, but you'd have to make dozens of attempts when ordering to find one that was acutally in stock. It was always pretty annoying. Good burgers, though. Not a destination in my book, by any means, unless you like reading long lists of beer names. I have mixed feelings about the Lebanese Taverna on Connecticut Ave. I am at the Marriott there every January for a conference and it seems at least once each time I'm in line at the Lebanese Taverna with a bunch of other people waiting for a table for 8 or 10 or 12 for some food I don't even remember an hour later. And I believe our drink options are always iced tea or water, even though we are ordering off the menu, which may be a fairly limited lunch menu. They seem just as tired of the conference hotel crowd as we are of them. ... either the red wine has biased my recollection of the event, or it really is true that they're just so overwhelmed at lunch time that it's more of an assembly line feeling. So I recommend it for dinner, but not for lunch. Another nice relaxed/cozy/romantic dinner spot on the same side of the street, just a few doors up, is the Italian restaurant; can't remember the name, but it's very nice, especially if you don't have an evening session at the conference you need to rush back to. Over in Adams Morgan, I like the Grill from Ipanema (www.thegrillfromipanema.com). It's a neat, cool, dark, bar, where you can get a real caipirinha, a good bowl of feijoada, and a variety of tasty steaks. "Back in the seventies, when I lived in the Maryland suburbs..."
which screamed to me--McDonald's Raw Bar--I think it was McDonald's--in Bethesda on Wisconsin Ave. where there is now either a high-rise or a Metro station. Regular haunt for oysters, I have a picture of my 15 month old niece sitting happily on one of their tables eating cocktail sauce and saltines. A friend did a pen and ink drawing of it in memoriam before it was torn down so my brother who was a regular would have something to regret every time he looked at it. While I can't make the comparison to Pizza Paradiso, I will put 2 Amys above Spacca Napoli--but below Pizza Bianco--for just a flat out great pizza and grand accomplices, particularly some spectacular charcouterie (sp?). I had a wild boar capicola, drizzled in olive oil and topped with some mungy cheese, that was out of this world; the duck prosciutto wasn't bad either. They offer a ton of fun little nibbles--olives, crostinis, anchovies, etc.--some simple yet good salads, and a fun wine list, and they don't take themselves so seriously that eating a pizza is an academic exercise. Whereas I went to Spacca, Bianco, and Una Pizza to evaluate, here I just enjoyed the simplicity and success of well-executed food--even my ex-girlfriend's boomerang-shaped calzone-thing, stuffed with ricotta and pesto, was a major guilty pleasure. Other thoughts: CityZen and Blue Duck Tavern are excellent; Rasika is not as good as you want it to be. Any Andres restaurant (excluding Minibar, I presume) is going to be consistent but not anything revelatory. He's a concept guy; his restaurants are, to me, LEYE-like. Crisp and Juicy - Best roasted chicken on the f-ing planet. I personally prefer this place to Pollo Rico. So good you can't even believe it. Ray's the Steaks - Has, in my opinion, the best steaks on earth. The place is really bare bones..minimal decor...do NOT dress up for this place even though it's a steakhouse. Hollywood East - Has my favorite Chinese food in the area, plus awesome Dim Sum everyday till 3. Cantler's Riverside Inn - This place is really fun if you WANT to drive 45 miles to get crabs. They sell crabs by the bushel, and you sit on the bay and tear open crabs and eat em. Five Guys - Has SUCH good burgers...god, they're so f-in good. Definitely stop by when you see one. Sweet Willie wrote: some associates like Tyler Cowen's ethnic guide to eating DC. I have not tried any of the restaurants listed. Back in 2004, Sweet Willie recommended Tyler Cowen's Ethnic Dining Guide to Washington, DC. As of December 2006 it is in its 22nd edition (the Internet can do that) and is 83 single spaced pages. I was at a conference in the wilds of Pentagon City (technically in Arlington, on Glebe Road), and Tyler Cowen's Guide was a life saver. For dinner we found a very good Moroccan restaurant, A Taste of Morocco in Arlington, with good dishes, topped by a superb chicken bistallah. The real find was a Thai restaurant, Thai Square. Professor Cowen (he is an economics professor at George Mason and a libertarian) recommended the Pig's Knuckle and was he ever right: it was perfumed with anise and cinnamon and ever so tender. The Crispy Honey Roasted Duck with Basil was delightful as was the Crispy Squid with Basil. We ordered eight entrees family style and they ranged from the conventional (Pad Thai) the more exotic. For appetizers we ordered a trio of salads: Somtum (Green Papaya Salad), Nam Sod (Minced Pork and Pork Rind), and Grilled Flank Steak with Crunchy Roasted Rice. The third was the favorite of the table. All in all this is a restaurant that would stand up well against most of the better Thai restaurants in Chicago. The owner informed us that although the cuisine was not particularly regional, she hailed from Central Thailand, and most of these dishes were common there. This lunch banquet was about $20/person. thomasec wrote: Sushi Sono - THE best sushi from DC to Boston. No place is even close. Mr. X is spending a few weeks in DC for work, so I got the chance to spend the weekend in DC with him. I searched LTH Forum and other boards for some dining suggestions. I probably had 25-30 options on my few sheet of paper. Unlike Ronnie Suburban and his friends, Mr. X and I try to keep it to 3 meals a day with maybe a snack thrown in. The good thing is that we worked up an appetite. The weather in DC was perfect for walking around the city. We decided to head to the mall area before our reservations at the Holocaust Museum. We lunched at the Teaism location on 8th Street NW. I was hungry, so I didn’t look at the menu in depth. It had a broad assortment of items with an Asian flair. Some folks were having brunch – some sort of French toast went by. Mr. X. had a chicken curry. I chose the salmon bento box, which contained edamame, rice, cucumber salad and salmon. I didn’t expect the salmon to be cold, but once I got past that, it was a decent piece of fish. We both liked the cucumber salad. The pickled ginger with the cukes added more flavor than I expect in a cucumber salad. Mr. X enjoyed his chicken curry. After a few hours in the Holocaust Museum (a very worthwhile use of time), we headed back to our hotel. We did stop to enjoy the late afternoon sun along with the toffee-granola-chocolate chunk cookie from Teaism. That was a fine cookie! There were several options on my list for dinner. We learned that one should try to call for same-night reservations sooner than 5:30 PM. (oops) We decided to take a chance at the downtown location of Jaleo, a tapas place. After a reasonable 15 minute wait (and a terribly sweet glass of sangria), we were seated. Mr. X started with the butternut squash soup special, which he declared one of the best soups he’s had this year. My roasted asparagus tapas was good (my not so helpful description: there was a grated cheese on top and a lemon sauce), but the soup was better. We then had the peppers stuffed with goat cheese, dates wrapped in bacon, garlic shrimp and the patatas bravas. The peppers didn’t really have much flavor, but we liked everything else. (dates in bacon are one of life’s perfect foods.) The Jaleo version of patatas bravas stood out – the potatoes had good crispiness, nicely balanced by the spicy tomato sauce and aioli. I had read good things about the Dupont Circle Farmers Market, so we headed over there Sunday morning. One well-known vendor sells croissants, breads and other pastries. I love to start my day with coffee and a chocolate croissant! Mr. X had some sort of mixed fruit tart. Both were delicious and fulfilled our butter quota for the week. I was envious of the farmers market -- along with fruits and vegetables, there was a wonderful variety of meats, oysters and cheeses available. Unfortunately, we had no means to cook anything we bought. We made do with our pastries and a couple of honey-crisp apples. We then made our way over to the Georgetown Pizza Paradiso. It was too early in the day to sit downstairs at the Birreria Paradiso, but the beer was available upstairs. We split the special pizza of the day: basil, fresh tomato and buffalo mozzarella; and a roast pork panini. The sandwich was great – the pork was flavorful and moist. The mozzarella on the pizza was fresh and tangy. I have to admit the overall flavors didn’t wow me. The crust did have a nice crispiness on the bottom. There was no real char on the pizza for those who look for that. I had the American beer flight, but can’t remember what the selection was. Pizza Paradiso was a pleasant stop for us. So we strapped on the walking shoes and headed over to Chinatown. We each had the hong kong wonton soup, no noodles, and shared the baby clams with black bean sauce and scallops in black pepper sauce. The soup was great – those dumplings are quite tasty. I very much enjoyed the clams – it’s not a dish I’ve had before. The clams were fresh and the sauce quite flavorful. I have learned that Mr. X is not a huge fan of shellfish. He dutifully ate three clams, but kept his focus on the scallops. They were well-prepared and, well, peppery. I am just relieved that I will have one less regret in my life after our satisfying dinner at Full Kee. For me, this was a great two day trip of sight-seeing, walking and eating. I can only hope that Mr. X can use my notes for future dining adventures while he is stuck in DC for work. Thanks to all you LTHers who helped guide us! A fine line separates a culinary signature from a tic. Earlier this month I was in Washington for a week, and at the suggestion of friends I tried Komi, Johnny Monis’s Greek-inflected, slightly rustic, comfortable hot spot. And there is much to like – the service, the collection of well-composed Greek wines (and not a stereotypical Retsina) and the finely-prepared cuisine. This night my companion and I selected the dinner: a selection of nine mezzathakia, a pasta, an entree, and dessert. We were well-treated. My only complaint was granular. This chef’s four letter word: salt. Sometimes dishes are oversalted out of incompetence: that is not the case at Komi. Chef Monis uses salt to add zest, a taste dimension that often characterizes his dishes. Once or twice during the meal would have been memorable, but the number of dishes that included salt as an ingredient or distinctive flavoring was startling. From the roasted dates with fleur de sel to the oversalted (although perfectly moist) spit roasted katiskaki (goat) to a rather unpleasant Meyer Lemon granita with red sea salt to salty pecan gelato (this I did not order, but there it was on the menu), one could not escape the condiment. Perhaps we should not have been surprised when the farewell gift was a salted caramel lollipop. A chef whose inventions are as distinguished as Chef Monis can find other ways to enliven his plates. Of the mezzethakia I particularly admired the exquisite, lush cauliflower panna cotta with American caviar, langoustines, and sea urchins. The braised octopus with poached quail egg, capers, pig knuckles (? ), and lentil salad was memorable as well. Also successful was a poached lobster salad with bottarga. Both of our pastas were sublime. I particularly admired the tagliatelle with rabbit, snails and eggplant. Here is a chef who knows how to cook al dente. My companion’s rock shrimp risotto with Meyer lemon and sumac-braised pistachio was filled with delicious surprises. Even in my year of dining in New York, I never was treated to such a pair of pastas. As our main course, we selected the spit-roasted katsikaki – as moist a goat as can be imagined with a delightful crunchy skin. Had the salt been halved this would have been an astonishing dish. The side dishes, pickled plum, Greek oregano, eggplant puree, truffled beet tsatziki, and Habanero hot sauce added complexity to the goat and homemade pita. At first bite the salt added to the pungency of the dish, but soon I wished for pure goat. The sides could have provided the pungency. Dessert – toasted almond cake with bananas and rum zabaglione was pleasurable – and not at all salty – flavorful but slightly dry for my taste. I hope to return to Komi on my next visit to Washington with a doctor’s note a demand to lighten our sodium footprint on this fragile planet. 2. Search out the best local Vietnamese places. The DC area has a huge Vietnamese population. We went to Pizzeria Paradiso near Dupont Circle. 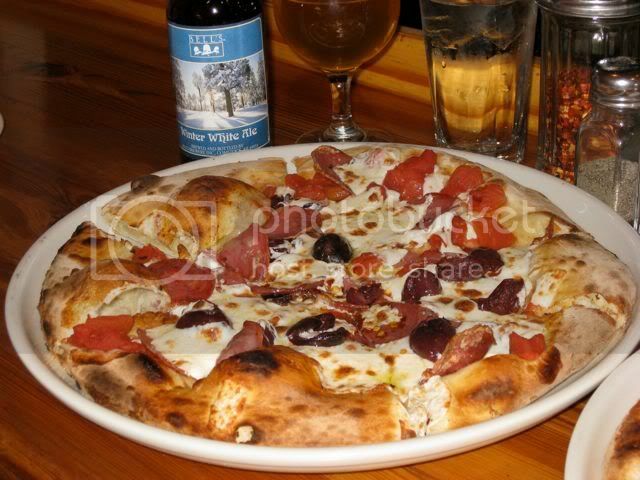 We found the pizza to be excellent, the atmosphere just right and the brew of the day was Bell's Winter White Ale, an ale Chicagoans I understand now have to go out of state to find this outstanding brew. 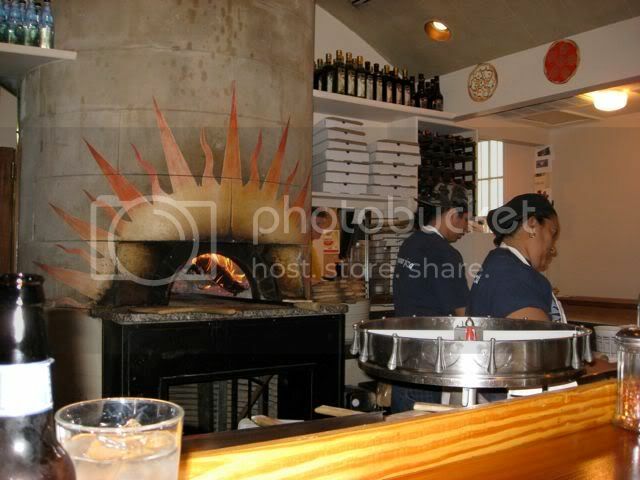 We sat at the bar counter with seating for 6 that looks directly onto the pizzaiolos as they make pizza at the wood fired oven. 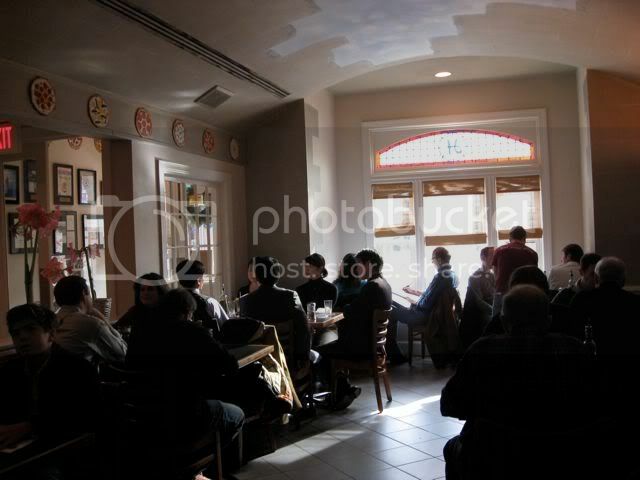 The dining room to our back was plain and intimate with seating for about 32. 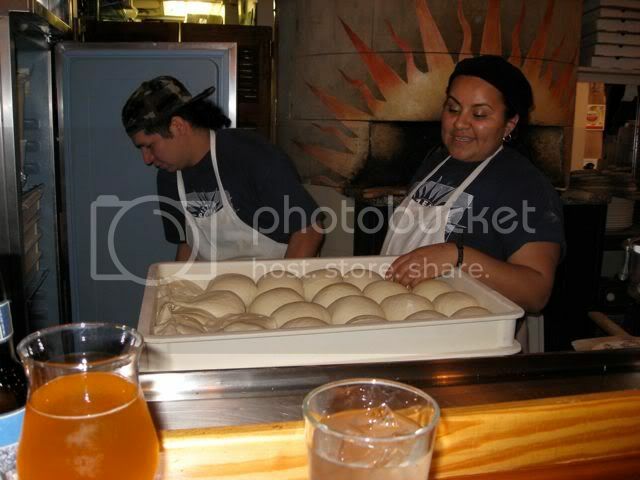 We ordered the Atomica and Bosco pizzas. Menu descriptions are here. teatpuller wrote: I lived in DC for five years. Chicago blows away Washington in terms of food in almost all regards. It's interesting...I am a DC native who has been living in Chicago for close to a year, and I can honestly say that there isn't a single restaurant I've tried in Chicago that has lived up to the best of what my hometown has to offer. Maybe it's a personal thing, but it seems like even Chicago staples (Thai, Mexican, Pizza, Steaks, Middle Eastern, etc..) can't compete with my favorite restaurants from home. Just yesterday I ate at a local Thai restaurant called "Thai Square" in Virginia that absolutely blows away even the best dishes I have tried at Tac Quick. Spicy squid salad, honey roasted basil duck, Tom Kha Kai soup...easily one of the best meals I've had in a long, long time. I do love Tac Quick, and probably dine there at least twice a month, but (to me at least), my hometown Thai restaurant is head and shoulders above anything that I have tried in Chicago. Maybe it's out of my own frustrations that I am writing this, but I have yet to find any true gems in the city of Chicago that have lived up to the best I have had in any east coast city. Maybe my upcoming trips to Blackbird and Sol De Mexico will change my mind. edit: Didn't realize that Gaf mentioned Thai Square in this thread. Obviously I am referring to the same restaurant, and obviously we have slightly different opinions about how it stacks up against Thai places in Chicago. 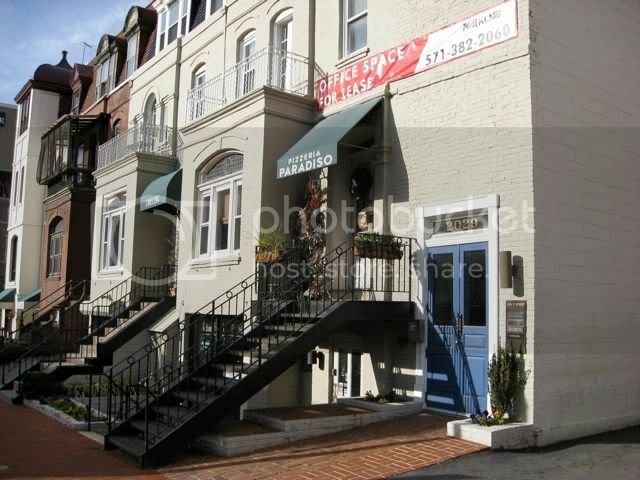 The best pizza I have ever, ever had was/is at Pizza Paradiso in Georgetown. I have tried my best to duplicate it in Chicago - D.O.C., Spacca Napoli, Napoli Spacca, (all have certain things great), but does not come too close to Pizza Paradiso in DC. I can't figure out what makes it's so different?!?! 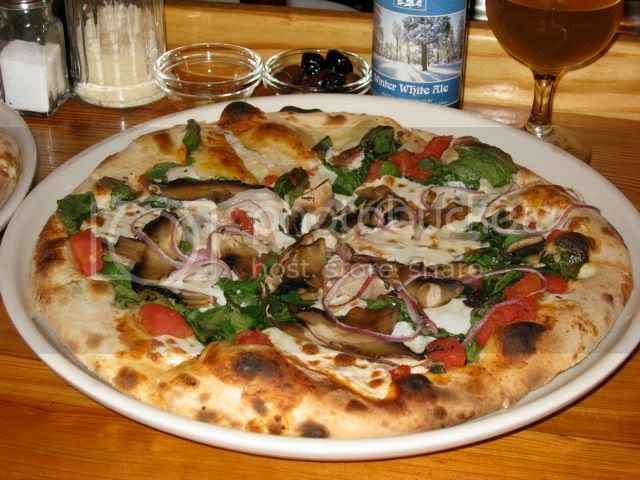 Snark wrote: The best pizza I have ever, ever had was/is at Pizza Paradiso in Georgetown. Personally, I prefer 2 Amy's to Paradiso (although both my parents strongly prefer Paradiso). As if their house cured meats and small plates weren't enough, 2 Amy's also serves to die for homemade donuts on Sunday mornings. Paradiso tends to put a a lot of salt in their crust...maybe that's the difference? I dont know - because my wife and I both feel the same. Maybe it the ambience. Maybe the freshness of Parma Prosciutto. I have no idea - but want to to know why - actually. But I've been there a few times now and I always say to myself, "This is the Best!. But have not beat it here - albeit amazing pizza here, granted. Actually DC isn't so bad, but what Mexican restaurant are you talking about? There are very few Mexicans in that area. There are like a million in Chicagoland. Never found a good Thai restaurant in DC. Two Amy's pizza is great, but I'm not going to wait an hour in the cold or swealtering hot just to get a seat. Lebanese Taverna, I'll give you that. DC has better Vietnamese. Also Ethiopian. But I throw down the gauntlet when it comes to Mexican. No way. Tex-Mex maybe..Austin Grill was one of our favorites. I think we're all lucky to be able to partake of both great culinary metropolii! As I (and Gaf..) stated, Arlington is home to Thai Square, which is easily on of the best Thai restaurant I have ever been to. I'm half Lebanese, and I never really liked Lebanese Taverna. My favorite places for middle eastern cuisine are Neyla in Georgetown, and the Lebanese Butcher in Falls Church. Bacchus in Bethesda is also very, very good. While not technically in Washington, Mari Luna, just outside of Baltimore has some of the best traditional Mexican food I have ever had. As for waiting an hour for a table at 2 Amy's...I personally have no problem waiting an hour for pizza THAT good. There is certainly no accounting for taste. I enjoy DC restaurants, no doubt about it, but rate Chicago higher. Pizza Paradiso versus Burt's. No contest. Burt triumphs. Pizza Paradiso versus Spacca Napoli. Versus Vito and Nicks. Versus Candlelite (in its prime). Pizza Paradiso both times I have eaten their pizza has been worthy, but not memorable and no competition for the best New York, Chicago, or New Haven Pizza. As for Thai Square, it is a very fine Thai restaurant (as noted above on this thread). The best dishes were sublime and comparable to TAC, Spoon, Sticky Rice, but there were others that were quite ordinary. Choosing well Thai Square would give Chicago Thai restaurants a run, but hardly blow them away. I like Full Kee, but it doesn't compare with the best Chicago Chinese restaurants. And at the high end, DC doesn't have a restaurant that compares with Alinea and Trotter, although I do think very highly of Minibar (not really a restaurant, however) and CityZen. GAF wrote: There is certainly no accounting for taste. I enjoy DC restaurants, no doubt about it, but rate Chicago higher. I will agree that Full Kee isn't as good as the best Chicago Chinese restaurants, but have you ever tried Hollywood East Cafe in Wheaton? Easily better than anything Chicago has to offer, and I think on the whole, DC, Phili, and NY have more consistent Chinese food throughout the city. I guess I still find it mind-boggling that you can't find any decent Chinese food anywhere on the north side of Chicago. Try Sun Wah on Argyle.